In mid-November, Deer Isle - Stonington Schools will be producing Eurydice, by Sarah Ruhl. The play modernizes the Greek myth of Orpheus descending in to the Underworld to retrieve his love, Eurydice (pronounced Yer-ID-ah-see). In this telling, set in present day, Eurydice is compelled (not so gently) into the Underworld by the Nasty Interesting Man. Once there, she is able to get some parental advice from the only person able to stave off the effects of death, chiefly that all those who perish forget everything that they knew from their previous life. This is a dangerous endeavor, one which draws the attention of a group of characters, called Stones, who bring the unauthorized learning to the attention of the Lord of the Underworld. 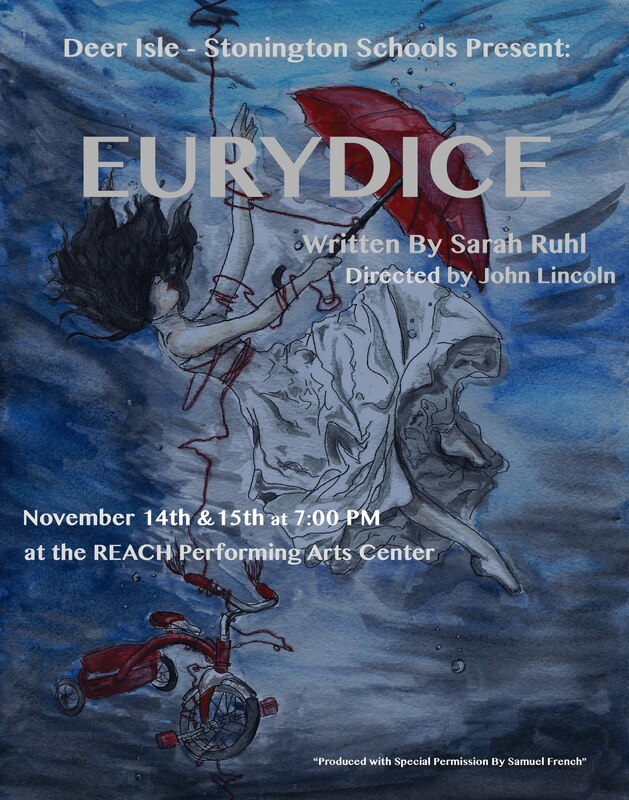 Eurydice is a drama with plenty of humor, with memorable characters, and with a good deal of power. This is a story of family, love, dedication, and the value of memory. Deer Isle-Stonington will present the show for the public at the REACH Performing Arts Center on Friday November 14 and Saturday November 15, both at 7:00 PM. Tickets will be $10 for adults, $8 for seniors, and $5 for students, though DIS students can attend either show free of charge. The production is Directed by John Lincoln. The cast is comprised of students in grades 9-12, including Matthew Duddy, Ali Eaton, Amy Friedell, Natalie Knowlton, Nicole Nolan, Marvin Merritt IV, and Veronica Pezaris. The crew, which is still being assembled, will be comprised of students from grades 6-12.